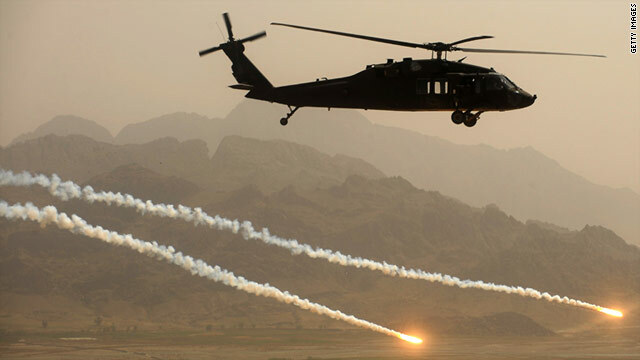 A U.S. Army Blackhawk helicopter fires protective flares while over Kandahar province in Afghanistan. Editor's note: Julian E. Zelizer is a professor of history and public affairs at Princeton University. He is the author of "Jimmy Carter," published by Times Books, and "Arsenal of Democracy." Princeton, New Jersey (CNN) -- Many people across the political spectrum have been unhappy with President Barack Obama's decision to send American fighting forces to attack Libya. They argue that Obama failed to provide an adequate explanation for making this choice. "Lots of confusion," said Sarah Palin, "What is the mission here in Libya?" A number of prominent Democrats have likewise wondered why the president entered this fight and said they felt Congress was not sufficiently consulted. Sen. James Webb, D-Virginia, and a Vietnam veteran, warned that "this isn't the way our system is supposed to work." Rep. Dennis Kucinich, D-Ohio, called the attack an "impeachable offense" (though he later said that impeachment was not on the table). With all the attention that is being paid to Obama's inconsistent rationales, there has been less concern about the ease with which the White House sent U.S. forces into combat. Indeed, the country seems so accustomed to presidents employing military force at their own will that there are few voices demanding democratic consent. The dynamics surrounding Libya are not unique to the current president. Rather, they are a product of the nature of war in modern America. For decades, U.S. presidents have been willing to send significant numbers of troops and materiel into overseas conflict with great frequency. Many changes since World War II have brought the nation to this place. The first is that Congress delegated authority to the president to start military operations by no longer insisting on a declaration of war. Since President Harry Truman sent troops to Korea in 1950, with congressional acquiescence but without a declaration of war, his successors have become comfortable repeating this practice. At times, they have requested resolutions of support but, in general, the bar has been lowered for what the president needs before he can send troops into conflict. At the same time, presidents have seen a vast expansion of executive power that increased the institutional resources available to them to analyze information, debate policy and even conduct covert warfare. The National Security Council was created in 1947, for instance, and gave presidents in-house counsel and expertise on national security decisions. Presidents can do much more without Congress. There have been critics of this development. As Obama himself said in 2007, "The president does not have power under the Constitution to unilaterally authorize a military attack in a situation that does not involve stopping an actual or imminent threat to the nation." But the critics have usually been ignored, or they have not proved to be very consistent. The second key change was the end of the draft. Until 1940, Congress had depended on an ad hoc system whereby the president and Congress created a temporary draft when the nation went to war, such as in World War I. But as America's involvement overseas deepened, this no longer seemed viable. In 1940, with America on the eve of World War II, Congress passed a permanent draft that remained on the books until 1973. Although the draft was far from perfect and allowed many wealthier Americans to avoid service, it was still a system that drew from a broad portion of the population. Politicians no longer call on the nation to pay for the financial costs of war. US Libya mission: Fly-over with no end? That forced the president to pay close attention to public opinion when going to war and to justify the decision, since many middle-class families, and voters, would feel the cost of war as their sons went abroad. The opposition to the draft played a central role in the anti-war movement in the 1960s. After Congress dismantled the draft in the aftermath of the Vietnam War, the government instead relied on a professional volunteer army that was far more removed from the daily life of many middle-class Americans. The president could send troops into conflict without prompting a majority of the country to start worrying about whether members of their families would have to fight abroad. Third, politicians no longer call on the nation to pay for the financial costs of war. This was an essential element to wartime politics up through Vietnam. During World War I, Congress expanded the progressive income tax and taxed corporate profits. During World War II, the government adopted a system of withholding taxes from paychecks and vastly increased the number of Americans paying income taxes from four million to 44 million. During the Korean War, taxes were raised and during Vietnam, President Lyndon Johnson, in a politically ruinous move, got Congress to pass a tax surcharge in 1968. Today, no one is asked to sacrifice to pay for war. The conservative movement shifted public debate to the right, and tax increases became much harder to accomplish even in times of war. During President George W. Bush's administration, for example, Congress cut taxes. As former Majority Leader Tom DeLay once said, "Nothing in the face of war is more important than cutting taxes." As with the draft, lowering the obligations required of citizens during wartime has made it politically easier for presidents to enter into conflicts. Strategically, the nation has also tended to fight wars that are different than the massive ground troop operations of World War I, Korea, World War II and Vietnam. Before 9/11, the U.S. focused on short and limited wars, often against much weaker nations, where the emphasis was on the use of air power rather than ground troops. The U.S. invasion of Grenada in 1983 boosted the morale of American foreign policymakers and bolstered public opinion about the military, despite the extremely limited nature of the operation. More significantly, Operation Desert Storm in 1990-1991 constituted an important moment in the political history of warfare. After a huge build up and dramatic rhetoric, the U.S. drove Saddam Hussein out of Kuwait quickly and without suffering many casualties. Even though the wars in Afghanistan and Iraq required substantial commitments of ground forces and lasted for long periods of time, the confidence from the success of Operation Desert Storm has lived on. Finally, there is the media. Since the advent of cable news in the 1980s, the effect of any military operation on the public mind has diminished. The fragmentation of the visual and print media gave Americans far more choices about what to focus their attention on and when. Anyone who wanted to watch evening television in the 1960s would have seen the nightly news about Vietnam, but now they can choose to focus 24 hours on the travails of Charlie Sheen. The competition among media outlets for limited audiences also creates immense pressure to find the next big story. Following an initial period of saturation, when every outlet jumps on a story such as Libya, there is a tendency to quickly move on. Military operations such as those in Afghanistan can become invisible to the media eye. While it is relatively easily to go to war, legislators also have the capacity to challenge the White House thereafter. Obama should remember that while Congress has delegated power over sending troops to war, they have retained considerable power to cause presidents political problems once troops are abroad. Through hearings and threats of funding cuts, as well as by legislators taking their case to the media, Congress can cause immense political problems for the president. Obama will finally make a speech to the nation about Libya, scheduled for 7:30 p.m. ET Monday. But the speech, coming long after American forces are already in the middle of the conflict, is almost beside the point. What's more relevant is we are already there with very little public debate. Obama's decision fits into a long-standing pattern -- one that many should find troubling -- of war becoming too easy to start, though not necessarily easy to win. Unlike some areas of policy, where people may have a sense that politicians need more flexibility, this is one area where the obstacles and challenges should be great.